NASHUA—Gilberte L. (Simoneau, Pelletier) Turcotte, age 97, passed away on November 17, 2018 at Crestwood Center Nursing Home, Milford surrounded by her loving family. “Gil” was born in Nashua on October 10, 1921, daughter of the late Armand and Leda (Mercier) Simoneau. She was the widow of Henry G. Pelletier, her first husband, who died on February 6, 1956, as well as her second husband, Rosaire Turcotte, who died June 3, 1985. She was a life-long resident of Nashua and a communicant of St. Louis de Gonzague Church. She had been employed by Sprague Electric for many years. Prior to her blindness, Gil enjoyed watching the daily mass on TV. She also loved to play Bingo, do crossword puzzles, jigsaw puzzles, and play the piano. She was predeceased by her brothers Dolor, Marcel, Gilbert, Rene, Laurent, Paul, Fernand, Maurice, and Noel Simoneau, and one sister, Colette Livingston. Survivors include three sons; Gerard Pelletier and his wife Linda of Crawfordville, FL, Robert Pelletier of Nashua, NH and Raymond Pelletier of Battleground, WA; one daughter; Pauline (Pelletier) Marquis and her husband Deacon Dennis of Peterborough, NH. She is also survived by seven grandchildren; Tina and Brian Pelletier of Crawfordville, FL, Bobbie Pelletier of Nashua, Dawna Moore of Cincinnati, OH, and Jennifer Lyman of Battleground, WA. Also Lisa Merrill of Nashua and Eric Marquis of Harrington, DE. Her family also includes ten great-grandchildren and two great-great-grandchildren, along with many nieces and nephews. SERVICES: Visiting hours will be held on Sunday, November 25, 2018 from 6 to 8 PM in the ANCTIL-ROCHETTE & SON FUNERAL HOME, 21 Kinsley St., Nashua. A Mass of Christian Burial will be celebrated on Monday, November 26, 2018 at Divine Mercy Church, 12 Church St. (GPS 161 Wilton Rd), Peterborough, NH at 11:00 AM. Burial will take place in St. Louis Cemetery, Nashua. 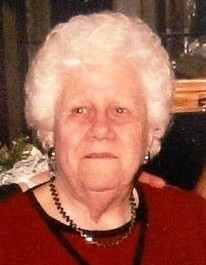 In lieu of flowers, donations can be made in her name to Compassus Hospice & Palliative Care, 170 South River Road, Bldg. 2, Bedford, NH 03110 or to Divine Mercy Church, Peterborough, NH.